The Colgate Eco Pad Portable Crib / Mini Crib Mattress is extra comfortable, a full 3" thick, made with high quality and safe CertiPUR-US certified eco-foam that substitutes plant oils for petroleum based oils. An ecru color damask cloth cover with food-grade waterproof backing puts cloth closest to baby's skin instead of vinyl or polyethylene plastic. Cloth binding provides strong seams. 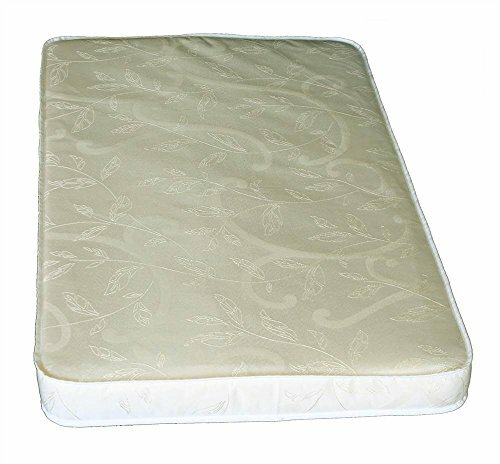 Mattress can be used on both sides unlike lower quality portable crib mattresses. This mattress is GREENGUARD GOLD certified to have no harmful air emissions. This mattress fits many styles of popular cribs and mini cribs. Lastly, the Eco Pad Portable Crib / Mini Crib Mattress is made by Colgate, The Crib Mattress Specialist!, who has been making mattresses and, trusted by parents for over half a century. Mattress size: 24.0"W X 38.5"L X 3.0"H.
View More In Crib Mattresses. If you have any questions about this product by Colgate Mattress, contact us by completing and submitting the form below. If you are looking for a specif part number, please include it with your message.